Goodreads: Patrick Riordan always thougth that nothing could match the adrenaline rush he gets from his job. But this Christmas, Patrick's pulse is really racing . 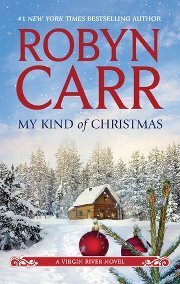 . .
Kritters Thoughts: If you have ever taken a visit to Virgin River with the fantastic characters that Robyn Carr has created, then this will be an extra special read to enjoy during the holidays. New characters are added - Angie and her special friend Megan - these two will make quite the impact in the small town of Virgin River. Angie has just survived a major car accident and needs to escape her parents home to recenter herself and find out what path she wants to go down next. Although the reader is quite aware how this book will probably end - the journey is still worth the ride! I love how my favorite characters from books past show up, but it still feels like a new book. The one sore spot I had was the age difference between the lovebirds, it was a little on the large side, but sort of worked because they had quite a few things in common. I must say it again - it was just fun to revisit these characters and at a different time of the year as I haven't read any of the other Christmas books in this series. I would absolutely recommend this book to readers of both the women's fiction and romance, it has enough for both sets of readers. It is also a book for new and old fans of the Virgin River series, you can start anywhere in this series and not feel completely lost.